Selective, competitive AMPA / kainate receptor antagonist. Sodium salt. DNQX disodium salt is a water soluble, selective and competitive AMPA and kainate receptor antagonist. It also acts as partial AMPA agonist in the presence of γ2 transmembrane AMPA receptor regulatory proteins (TARP) subunit. DNQX is also a neuroleptic agent that displays pro-oxidant activity. DNQX freebase is also available. 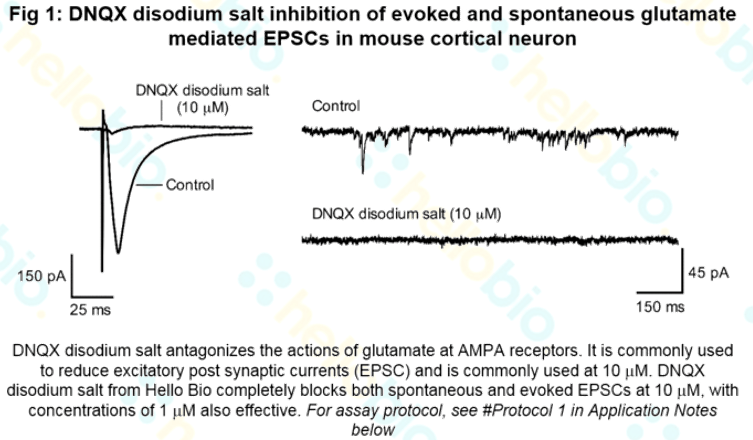 DNQX disodium salt antagonizes the actions of glutamate at AMPA receptors. It is commonly used to reduce excitatory post synaptic currents (EPSC) and is commonly used at 10 μM. 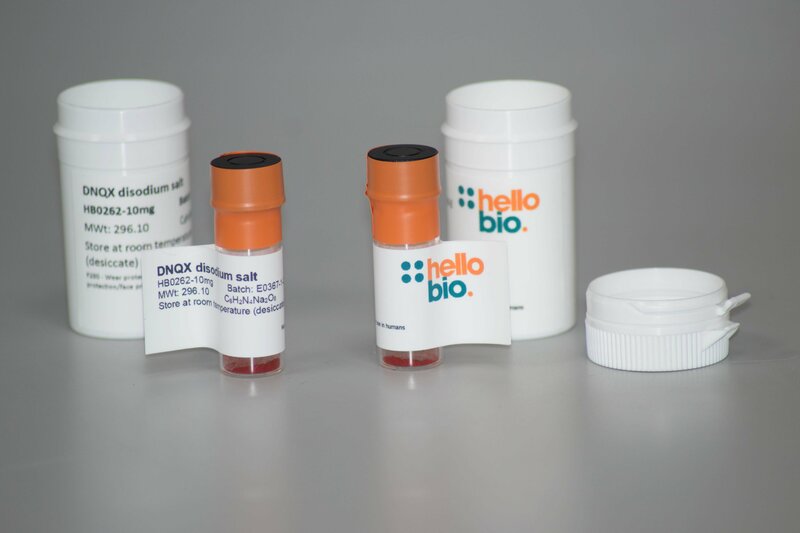 DNQX disodium salt from Hello Bio completely blocks both spontaneous and evoked EPSCs at 10 μM, with concentrations of 1 μM also effective (see Fig 1 above). EPSCs were evoked via a stimulating electrode placed in layers II/III delivering a single square (150 μs) pulse every 10 sec at an intensity that gave a reliable EPSC. Neurons were held at -70 to -60 mV (the reversal potential of GABA currents). EPSCs were continuously stimulated and recorded in response to 5 min applications of varying concentrations of DNQX disodium salt until complete receptor inhibition. Spontaneous EPSCs were recorded before and after addition of DNQX disodium salt by holding the neuron at -70 mV and recording for 10 sec. Recordings for EPSCs were made in the absence of GABAA-R antagonists. Redox properties and prooxidant cytotoxicity of a neuroleptic agent 6,7-dinitrodihydroquinoxaline-2,3-dione (DNQX). Šarlauskas J et al (2013) Acta Biochim Pol 60(2) : 227-31. TARP auxiliary subunits switch AMPA receptor antagonists into partial agonists. Menuz K et al (2007) Science 318(5851) : 815-7. Selective excitatory actions of DNQX and CNQX in rat thalamic neurons. Lee SH et al (2010) J Neurophysiol 103(4) : 1728-34. Pharmacological characterization of glutamatergic agonists and antagonists at recombinant human homomeric and heteromeric kainate receptors in vitro. 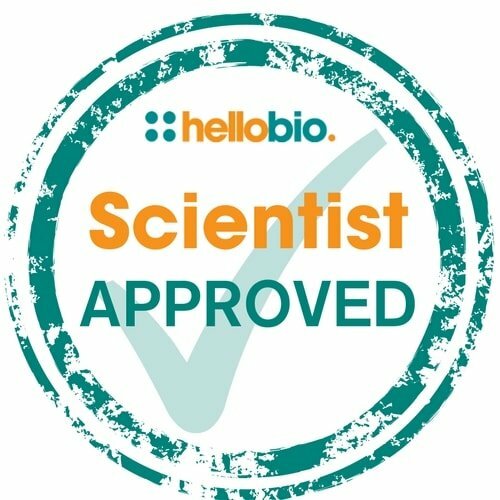 The following papers have cited the use of DNQX disodium salt (HB0262) from Hello Bio. If you have published a paper using this product, and it is not shown here, then please tell us! We will send you a free gift as a thank you! High frequency stimulation induces LTD of AMPA receptor-mediated postsynaptic responses and LTP of synaptically-evoked firing in the dorsolateral striatum. Second-hit mosaic mutation in mTORC1 repressor DEPDC5 causes focal cortical dysplasia-associated epilepsy.